We left home in Phuket around 11 am and we arrived in Krabi late afternoon. 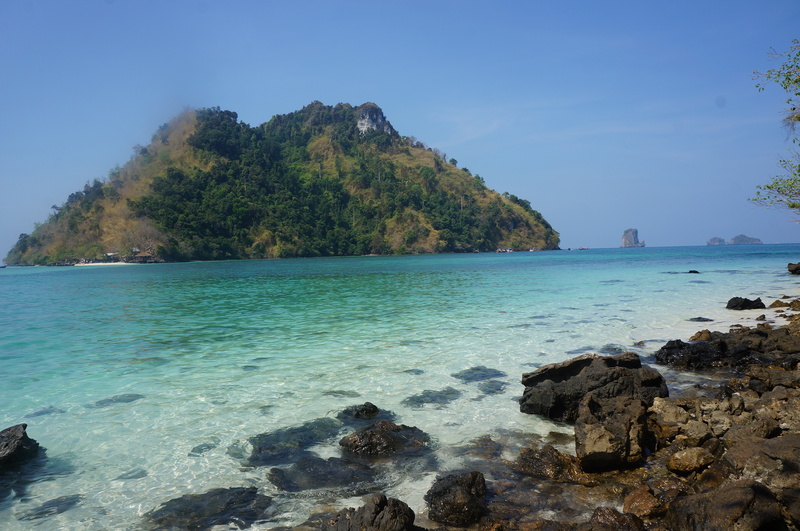 It would normally take only 2 hours from Phuket to Krabi if you drive non-stop. We checked in to a lovely 2 bedroom house which I booked via Airbnb. I like to stay in a private property or apartment rather than in a hotel because those properties provide better facilities than in a hotel and you get more space and of course better value. After unpacking and a bit of relaxing, it was just time for dinner. Because I’m a Thai I would definitely not go to eat in a tourist area like Ao Nang. 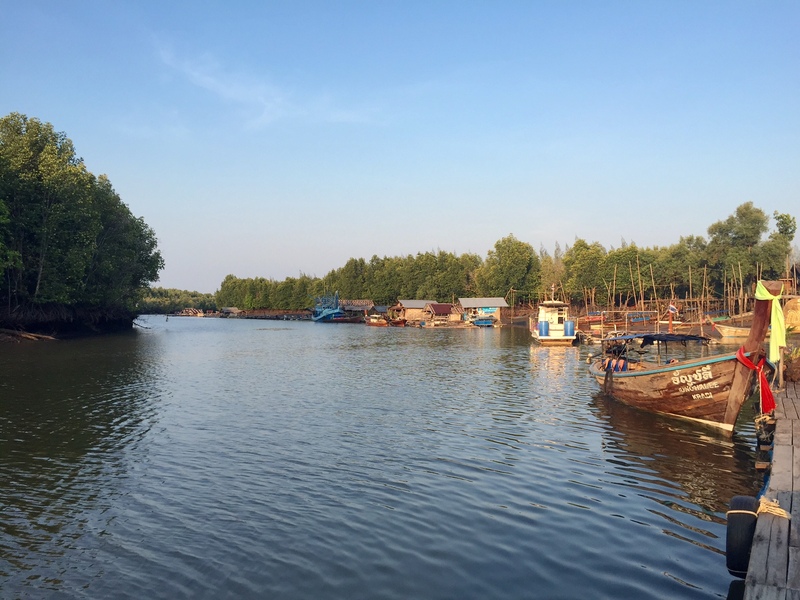 We decided to try one of the restaurants on the riverside in Krabi town called “Baitoey Seafood”. The food was the real deal and the price was reasonable, a great view over the river and the restaurant full of Thai people! The Thai style of eating is sharing all the food on the table and, as we were 3 people, we ordered a few things to share and eat with steamed rice. I understand that the western culture is to order your own dish, but it’s not common here for Thai people to order just one dish for yourself accept in a single dish restaurant. If you travel to Thailand with your partner or with a small group I highly recommend to eat in the Thai way and I’m sure that you would have a better experience of eating Thai food rather than just have your own dish! My day started with a simple local breakfast just opposite my place which was recommended by my host. 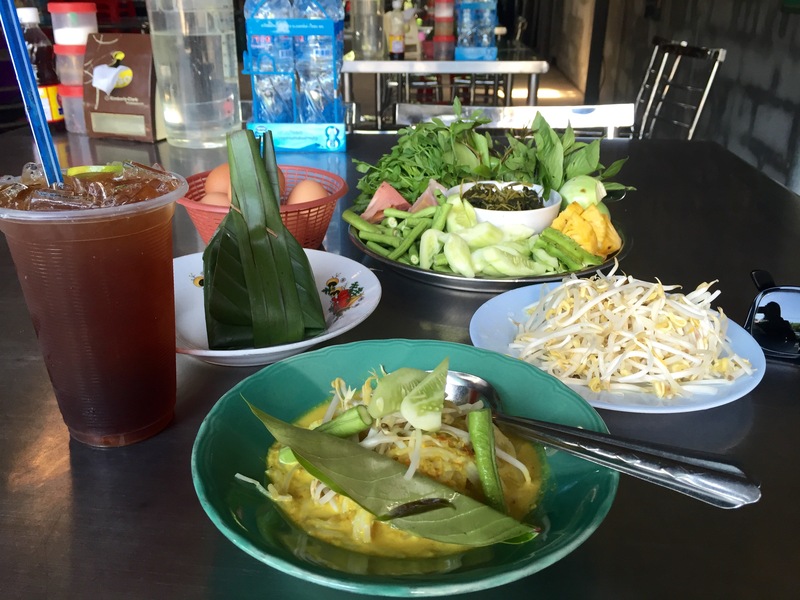 This local breakfast is a serving of rice noodle with many kinds of sauces that you can choose from, some spicy and some not, you eat the noodle mix with sauce and fresh vegetables to which you help yourself and boiled egg. It cost me only 45 Baht including iced tea. The restaurant was busy with local people. The name of the restaurant is called “Kha Nom Jeen Mea Well Sai Thai” (ขนมจีนแม่แวว ไสไทย). The restaurant is located on the main road half way between Krabi Town and Ao Nang so you can easily get a bus to here in just 15 minutes. The restaurant closes around 11 am. Opposite the restaurant on the other side of the road also have one of the best Chinese steamed buns you can find in Thailand. After breakfast we headed to Nopparattara beach which is next to Ao Nang. 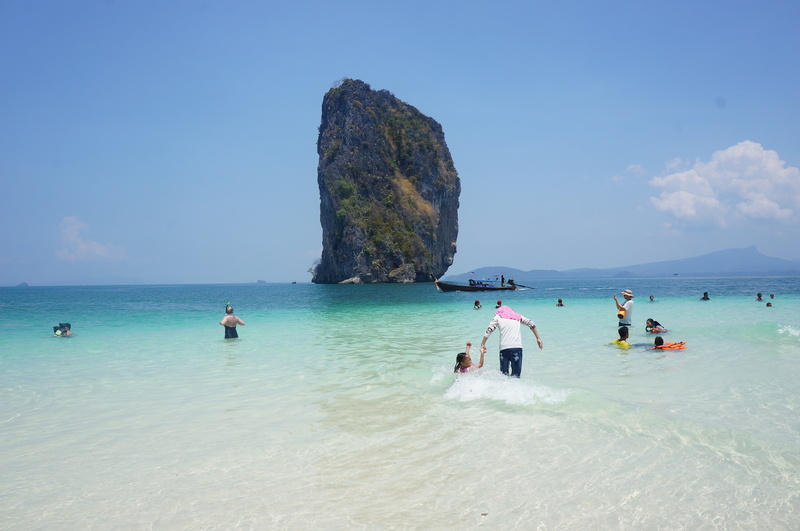 This beach is part of the National park and less crowded than Ao Nang beach and Railay beach. The beach is 3 km long and has nice shade from trees along the beach. The shade was perfect for me as I don’t enjoy being in the sun all the time. The beach is popular for Thai people to have a picnic under trees. The other side of the road is full of shops and restaurants at a reasonable price. 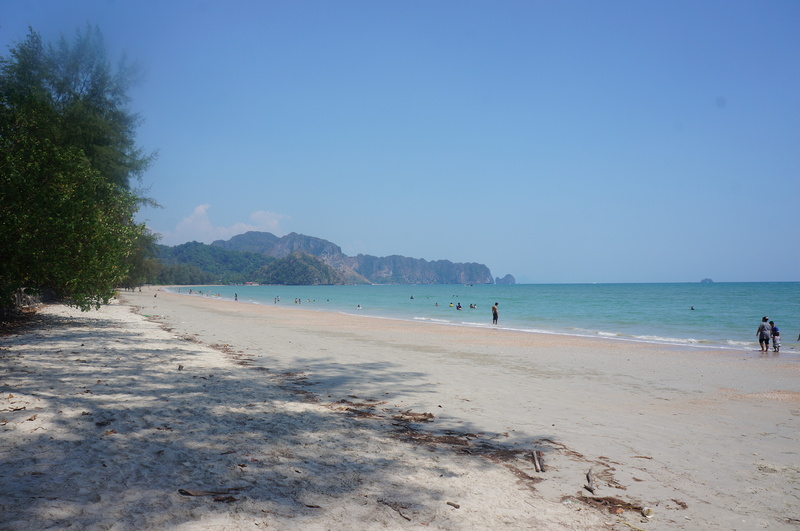 This beach can be your everyday beach after a boat trip to islands and if you have had enough of Railay beach. 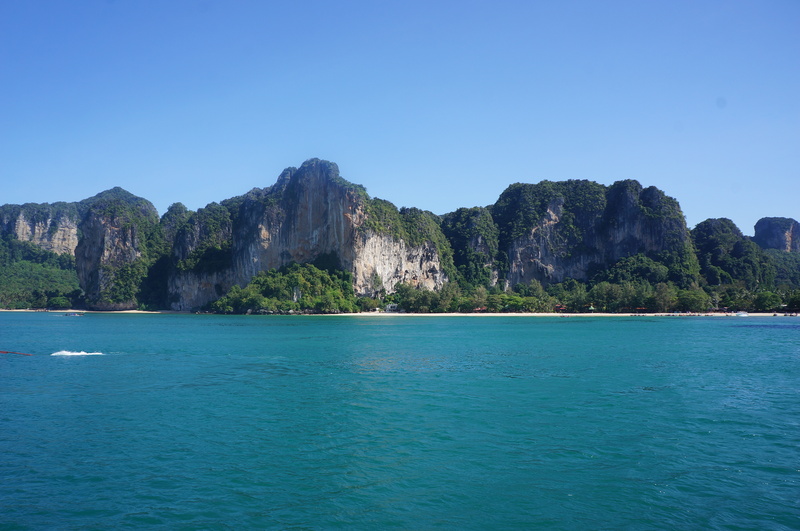 We decided to take a day trip to 4 islands on our last day in Krabi (Tup island, Chicken island, Poda island, Railay beach). There are many boat trips you can choose from and many kinds of boats are available, e.g. long tail boat, speed boat or a big boat for a big group of people. The trip advertised 1,200 Baht for each person including lunch and transfer from hotel and drop off. The agency gave me the best price at 900 Baht each person so we booked with them. Later I found out that the Thai lady in the same trip has paid only 750 Baht! Never mind!! There are a lot of agencies in Ao Nang that compete with each other so go around and check the best price. After you believe that you got the best deal do not ask anyone in your trip that how much they have paid! We went to a seafood restaurant on the island near Krabi town called “Kanabnam View Seafood and Fish Farm”. This place was recommended by a local couple who I shared a dining table with at the night market on the previous evening. They said that not many tourists know about this place but it very well known by local people. The unique thing about the restaurant is that all the seafood is taken fresh from the water before it is cooked for you. 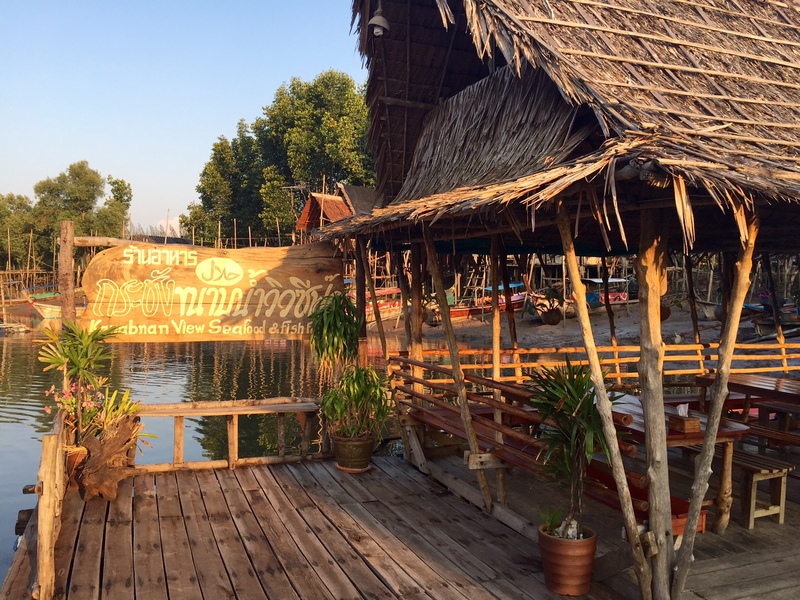 The restaurant can be reached only by a long tail boat from the pier in Krabi town next to the night eating market. It took us less than 10 minutes to get to the restaurant and the long tail boat cost 100 Baht each way. A boat driver will be waiting for you at the restaurant to take you back. The restaurant is just on the water side, stunning view, simple decoration, nice breeze and the food was really good! Please note that alcohol is not available in the restaurant as it located in a Muslim village. visit islands most of the time, you probably would like to stay in Ao Nang but Ao Nang is maybe not the best place to eat. A lot of people choose to stay in Krabi town which may have cheaper accommodation than in Ao Nang. 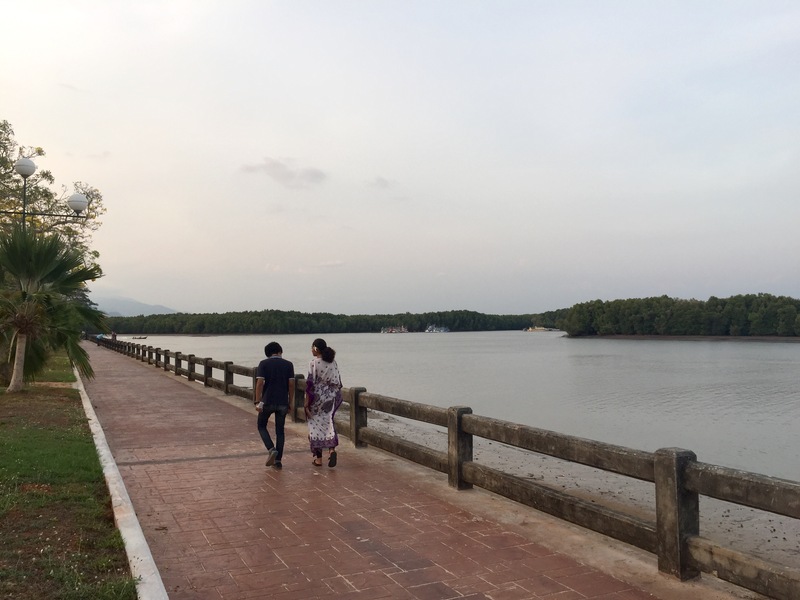 The great thing about staying in Krabi town is that there is more variety of local food at a reasonable price but the disadvantage is it is not near to Ao Nang where the beach is located. I stayed in a place that is located in the middle between Ao Nang and Krabi town which is about 15 minutes by car to each location but you probably need to rent a motorbike or a car for it to be more convenient. The local bus is very frequent from Krabi town to Ao Nang. This is my 3rd time in Krabi and I always enjoy coming here as Krabi is more lay back than Phuket.